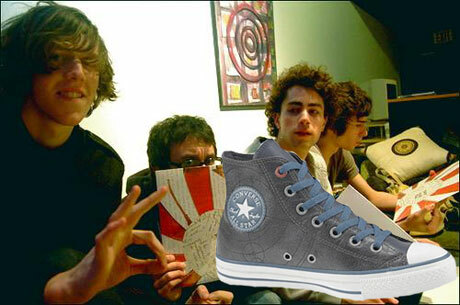 In an effort to be charitable, as well as fashionable, Tokyo Police Club have designed their very own pair of Chucks. As part of Converse's 1HUND(RED) campaign, the pop-loving Toronto rock outfit designed a pair sneakers, with ten percent of the proceeds going to the Global Fund to Fight Aids, Tuberculosis and Malaria. The band join 100 other rock acts, such as Bonde do Role, Matt & Kim and Green Day's Billy Joe Armstrong, in Converse's charity campaign, which is designed to "celebrate the artistic spirit and help eliminate AIDS in Africa." For Tokyo Police Club's particular shoe design, the band say they were partly inspired by the Hubble Telescope, which made them think of how all things are clearly connected, even if they are far away. The limited-edition shoes will be available at select stores, or can be ordered here on the Converse website. In other Tokyo Police Club news, the group say via their website that they are currently in the midst of writing new material and just might road test a few new tracks on their upcoming U.S. tour (you can see the dates here). However, the band gave no indication when they might start putting together the follow-up to last year's Elephant Shell. Tokyo Police Club "In a Cave"